Corbans Estate Arts Centre, Henderson. so it made for a show with a lot of variety and a wide range of styles and media. This year has been a busy year for me as I have been working on pieces for a number of group shows throughout this year and into next. So, setting aside some time to produce some new work just for this took a bit of extra concentrated planning and focus. I created three mini "bodies of work" which hint at the works I have been producing for other projects but which are all unique in themselves. 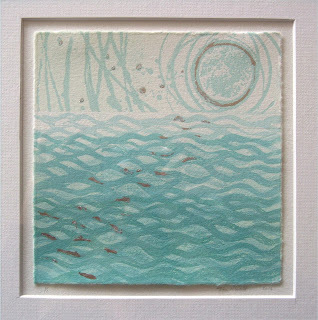 This series of prints was inspired by a summer of boating and my love for the sea. The processes I used included monoprint techniques and caustic etched lino plates (you can read more about the process I have developed here.) They also received a finishing touch of silver leaf. 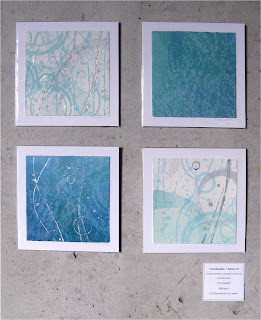 I created works for the wall and a further selection for "cash"n"carry". 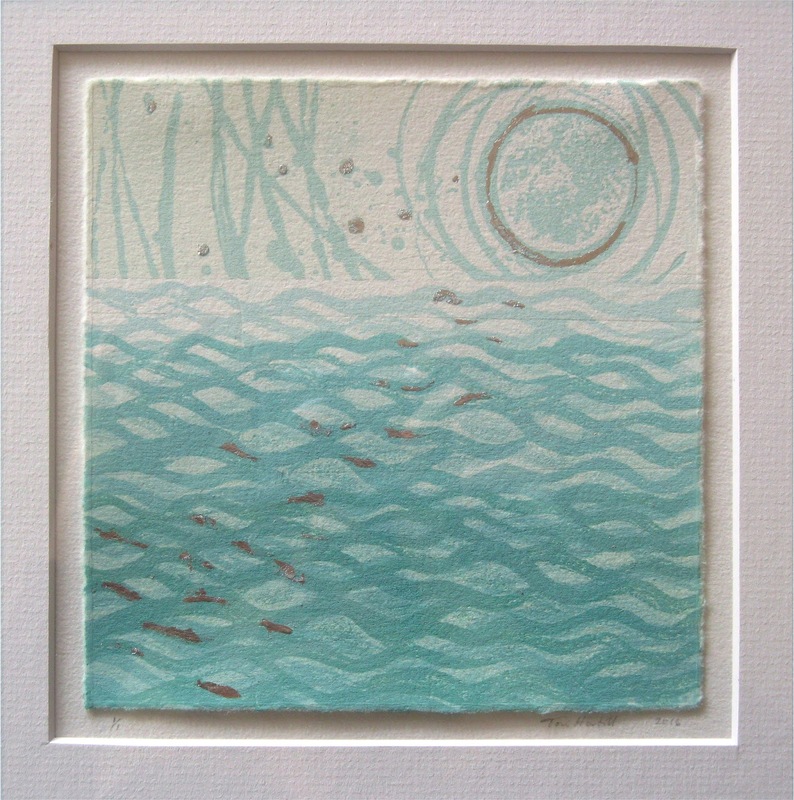 These prints "And breathe..." were created while experimenting with newly created caustic etched lino plates and monoprint techniques. They were a fun wee diversion from my more "serious" works. I was experimenting with the possibilities of working in multiple layers of transparent colours and effects. I have always enjoyed working in many mediums, and at all scales and I really like the idea of taking the print off the wall and out of the frame and so why not wear them? This is a selection of mini prints I have mounted onto wooden supports and finished them with jewelry findings and layers of varnish for protection. 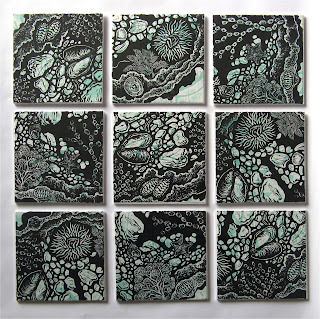 This series of works was created as a result of large lino cuts I have been working on for another project. 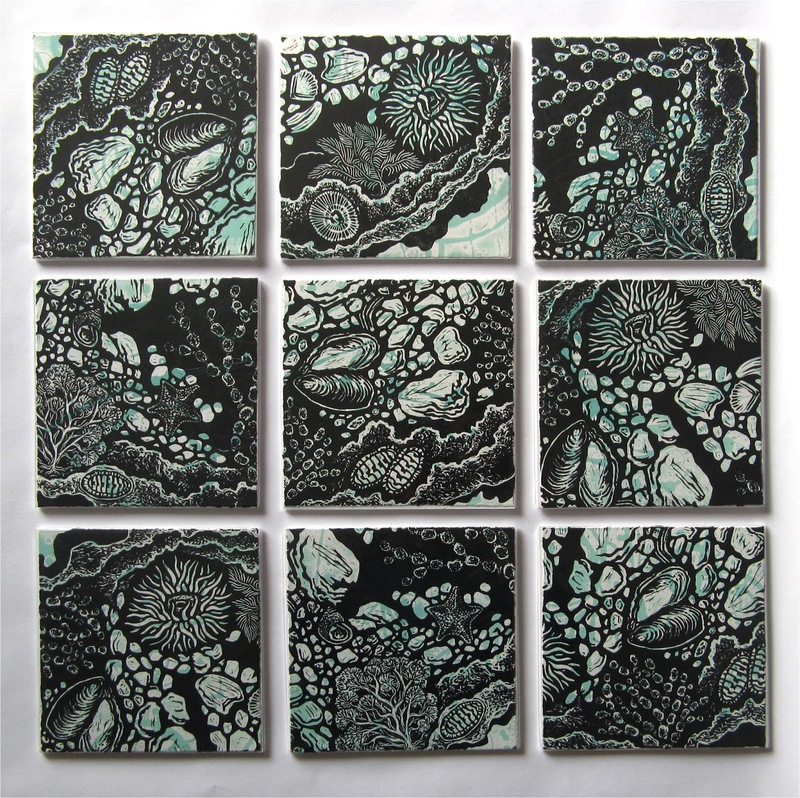 For these plates I used fine dremel burs and my new and delicious Pfiel lino carving tools. This was the first time I have managed to work so finely with lino and I can confidently say that the purchase of quality tools has made all the difference to my ambitions with the medium. I was curious to see how it would be to mount prints directly onto small wooden panels that can be purchased as a ready to hang wee object or as a group. I know for myself that I have little narrow wall spaces in my home where it is nice to hang mini artworks such as these. 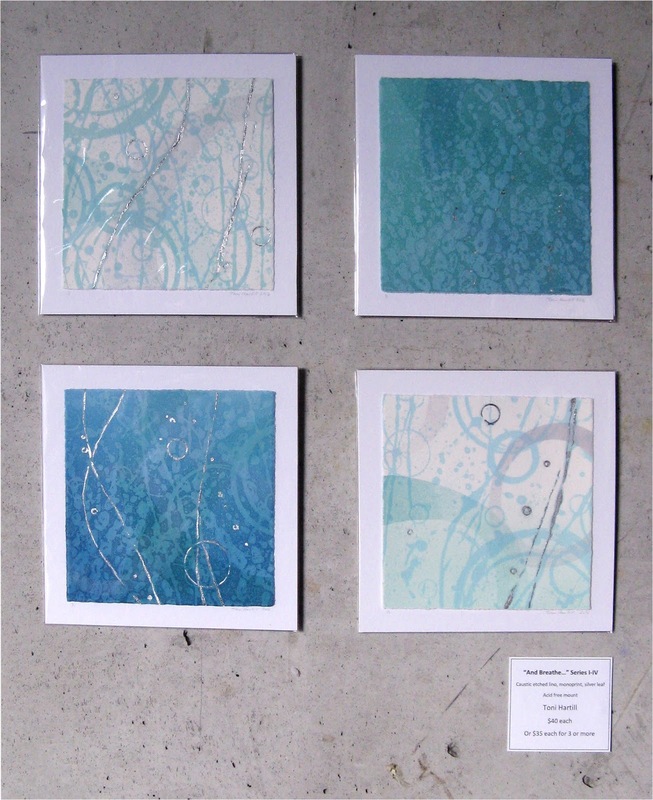 These are two print editions created for the PCANZ group show currently being exhibited at the Alfred Memlink Artspace Gallery in Wellington. To read more about these works you can link to an earlier blog here. "Across the Ditch II & III"
Finally, I had a table of works from previous years, all marked at super SALE prices and happily many pieces found their way to new homes. 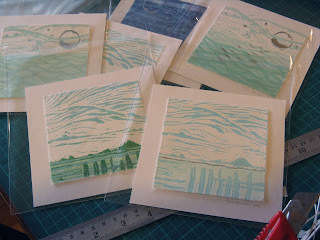 Some were even off to Australia and I think a couple of small works were off to America and Europe! 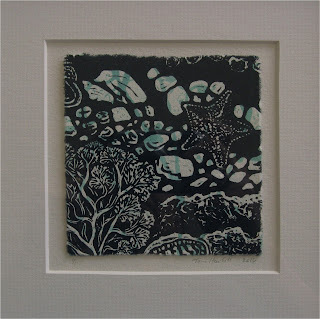 "Unfold" artist books and mini prints: Waitakere Printers Ink and Studio Printmakers group show: Opens Nov 5th. Depot Artspace, Devonport, Ak, NZ. Feedback and enquiries about artworks for sale always welcome! You can contact me through the comments box below and I will aim to respond asap.